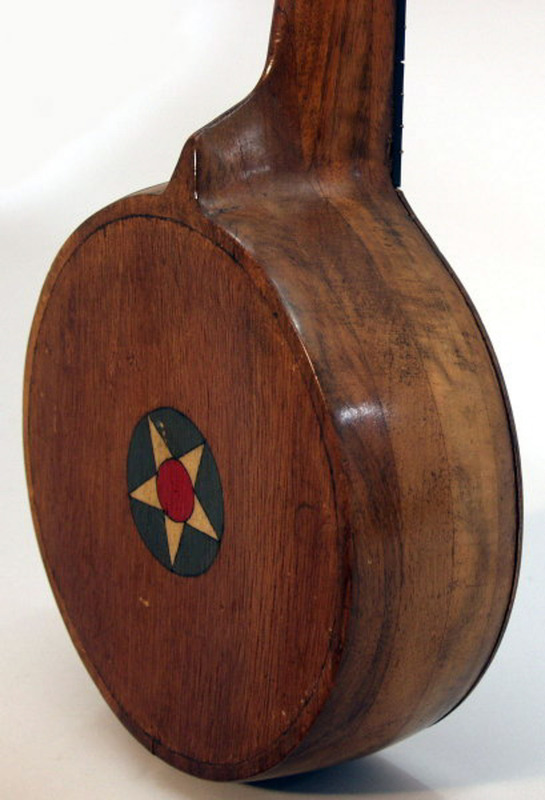 U.S. Army Air Corps Folk Art Model Soprano Ukulele (maker unknown), c. 1920-30's, amber varnish finish. 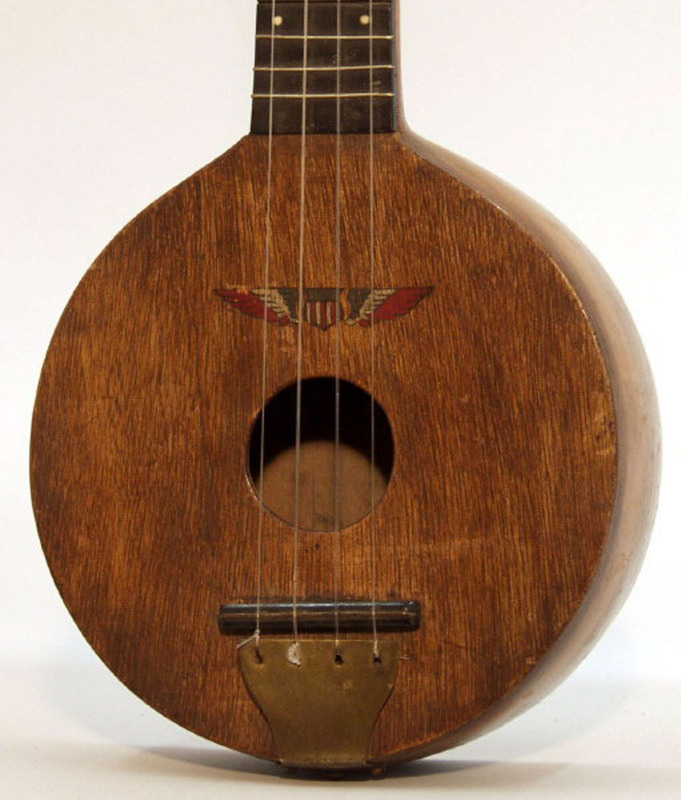 A truly spectacular example of a Folk Art instrument, this four-string ukulele gives every appearance of having been crafted by U.S. Army Aircorps personnel during the 1920s or 1930s, possibly on station somewhere in the Pacific. As far as we can tell the instrument looks to have been made out of the boss and blade of a 1920s-style wooden aircraft propeller! The round body and integral neck are built up from four layers of vertically laminated wood, with an added top and back soundboard. The neck is carved out of several of these laminations with a heavy ebony fretboard with celluloid dot inlay. 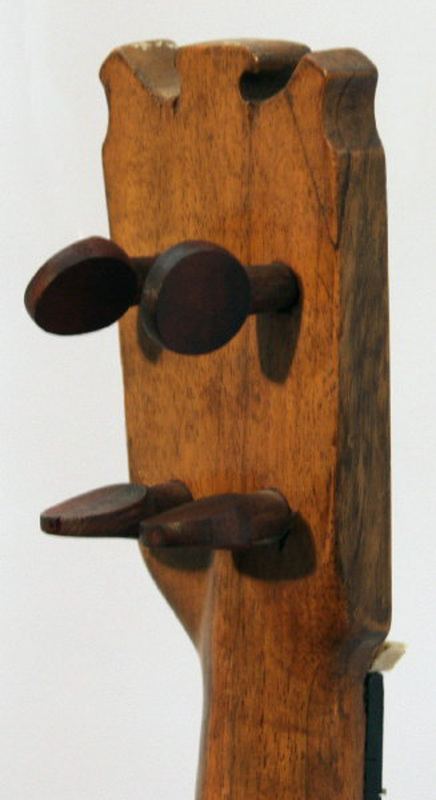 The headstock is carved squarish with crest-like decorations on the top edge and a volute on the back. 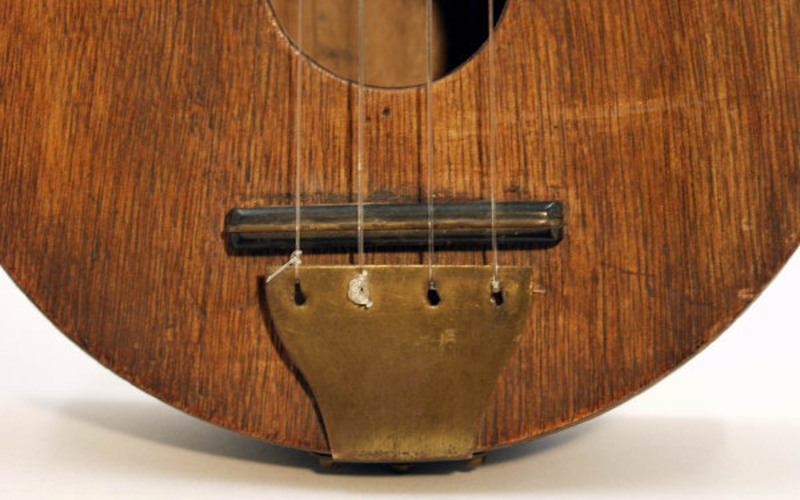 The tailpiece is cut brass, the bridge ebony with a brass saddle, and the large eccentrically shaped nut is bone. 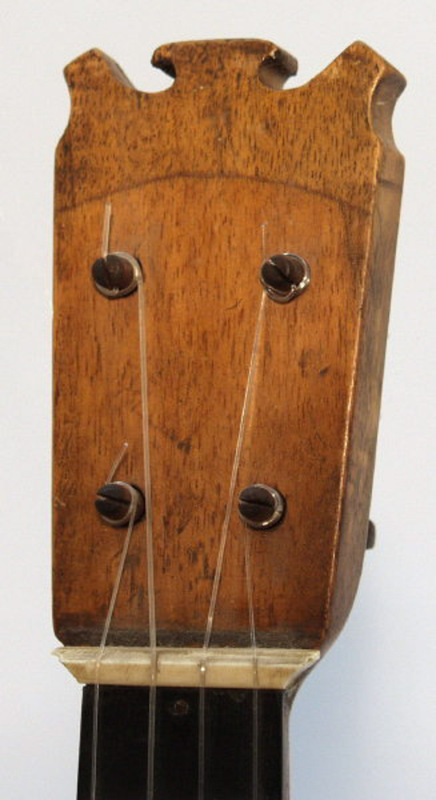 The only commercially-made components are the tuning pegs, which appear to be the same as those of a Wendall Hall Red Head Uke. There is an Air Corps crest painted in very sharp detail on the face and an aircraft roundel as used by the US between the World Wars painted on the back. All workmanship is to a high level for this type of instrument, although not as neat as a factory or dedicated maker. The most amazing thing is that the ukulele plays very well and sounds quite good, easily on par with many commercially-made instruments. 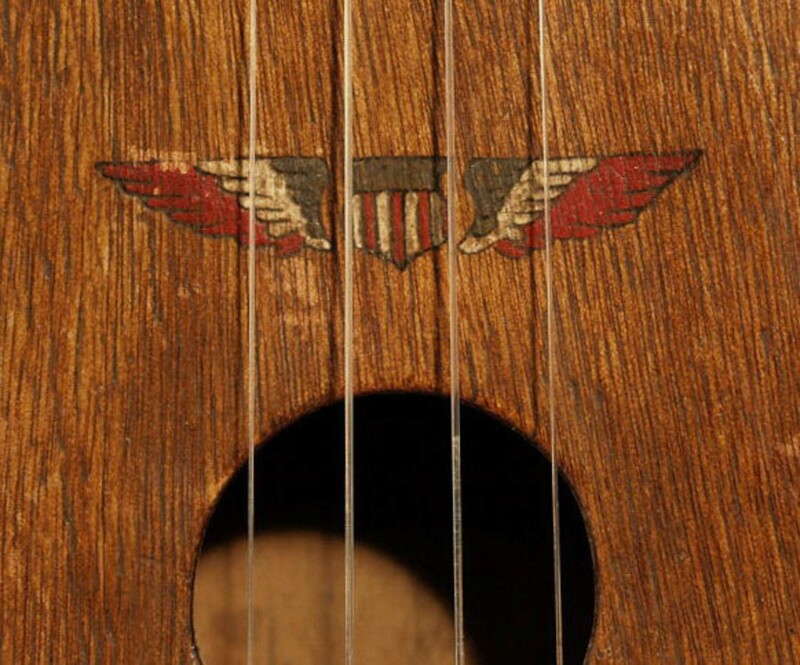 One can easily imagine flyers and maintenance personnel relaxing with the local "dames" playing tunes on this uke at Hickham or Wheeler fields on Oahu or Clark Field in the Philippines before the onset of the Japanese attacks of 1941. 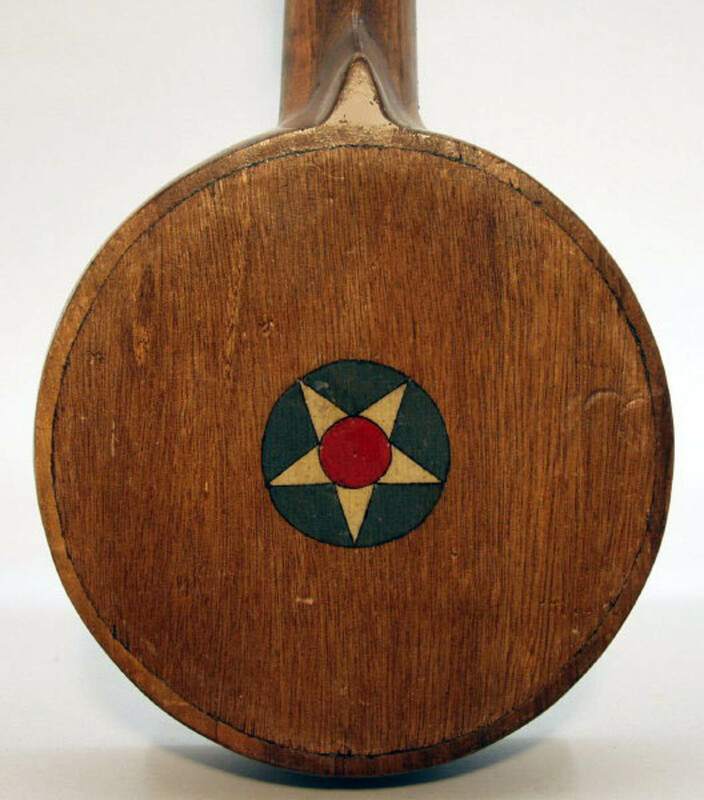 One of the most fascinating historical instruments we have ever found. Overall length is 20 1/4 in. (51.4 cm. ), 7 1/2 in. (19 cm.) wide, and 2 7/8 in. (7.3 cm.) in depth at side. Scale length is 14 in. (356 mm.). Good playable condition with some general dirt and wear; beyond stringing it up, we have not cleaned or altered it at all.